Stepping onto the New York City subway shouldn't require a brush with the dangerous or downright bizarre, but it often does: Last summer a woman unleashed crickets and worms on a packed train, causing a panicked and revolting situation that one passenger could only describe as "pandemonium." But the hellish journey of a packed F train that ground to a halt for 45 minutes on Monday might very well carve out new territory for subway horror stories. As the southbound F train rumbled through the city's bowels, it lost power, causing the air conditioning and lights to cease functioning. Temperatures rose markedly, steaming up the windows as passengers began to drip sweat in the dark. As one would expect, the train quickly became a stifling box of humanity, sending everyone into a sopping wet panic. Commuter Michael Sciaraffo wrote about the experience in a lengthy post on Facebook, claiming the conditions felt like "120 degree heat." It was so hot, apparently, that people started removing their clothes to gain some respite from the all-encompassing stuffiness and swamp-like conditions. Sciaraffo claims some people on the sweltering car tried to pry open windows in an attempt to gather whatever breeze could be felt from other trains passing by. It was that dire. Many started to feel claustrophobic and faint, as commuters tried to locate any pregnant women or elderly people who might have needed special care. According to Sciaraffo's post, the halted F train began moving after about 30 minutes, when another train began nudging it from behind. It took another ten minutes, he writes, for the F train to reach the next subway platform after getting pushed. Footage from the platform shows customers trying to pry the train's doors open, their fingers poking through the cracks like zombies as the unforgiving doors fail to budge. There were no injuries or heat-related illnesses reported after the fiasco, although this incident has seen the beleaguered MTA shoulder no shortage of deserved outrage. 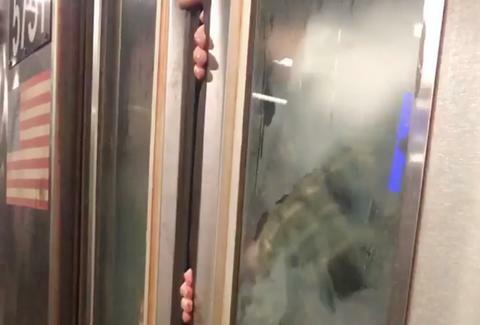 The F train resumed service with delays later in the evening while the malfunctioning train that morphed into a sauna of death has been decommissioned.